When I started this blog 3 years ago, my plan was to use these posts and articles as fodder that could be eventually turned into a book. And while I call it a “plan”, it was really more of a wish. I began with a post on Empowerment, and have since taken a long and winding road through my work, through my life, through my head, and through my heart. What started as a pretty straightforward focus on innovation in the workplace, ultimately veered toward my kids’ activities, flew up, up, and away with Superheroes, traveled to a galaxy far, far away, and delved into personal fables and adventures. And while my life became a stronger muse for this blog than I had expected, this blog ultimately made a larger impact on my life. Career decisions that I’ve made, the sabbatical moments that I’ve stolen, my priorities in how I spend my time, and the path I now am starting to see before me all have been heavily influenced by many of the words I didn’t even know that I needed to write. And as the writing led me on this journey, I am grateful for each of you who have joined me along the road. Some of you have been here from the beginning, some joined near the end, and many of you have passed in and out along the way. I know many of you personally, either from my present or from my past, and have been fortunate to virtually interact with countless others from dozens of countries around the globe. I hope that something that I have written has left even a small impact… you all have made a huge difference to me. And now I am fortunate to have finally turned this blog into my first book, Agents of CHANGE, which I have self-published on Amazon. It is not perfect by any stretch, and it will never be a best seller… but I am proud of how it all came together to represent that long and winding road I’ve taken. 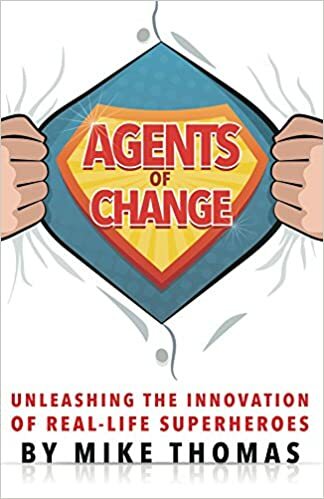 This book sets out to deliver a collection of snackable stories, examples, and fables that provide ideas and insights for creating a super powered innovation program, organizational culture, and purposeful life… to help you to unleash your inner superhero and to become an Agent of Change. I am hopeful that it will fulfill that promise. The Kindle version is now available for pre-order with a publication day, of course, on Star Wars Day (May the 4th), and the print version is actually available now as part of a “soft grand opening”. As this launches, I am filled with a mix of pride at the accomplishment, nervousness at the reception, relief to be at the end of the journey, and anticipation for what comes next. But most of all, I am thankful for all of you who have been such a big part of this. Thanks you for your support, your inspiration, and your imagination… and for helping Agents of CHANGE to go from Blog to Book. Your “first” book??!! Can’t wait to read it! Arrives on Friday… couldn’t wait for that silly Star Wars Day!! “First” book… of course. Why stop now? So many ideas… so little time. OMG – so EXCITING!! I totally need to talk to you about the nitty-gritty of publication this way (yeah, details). I’m heading to Amazon now…. It’s been a fun ride so far… I can’t wait to read your future book!